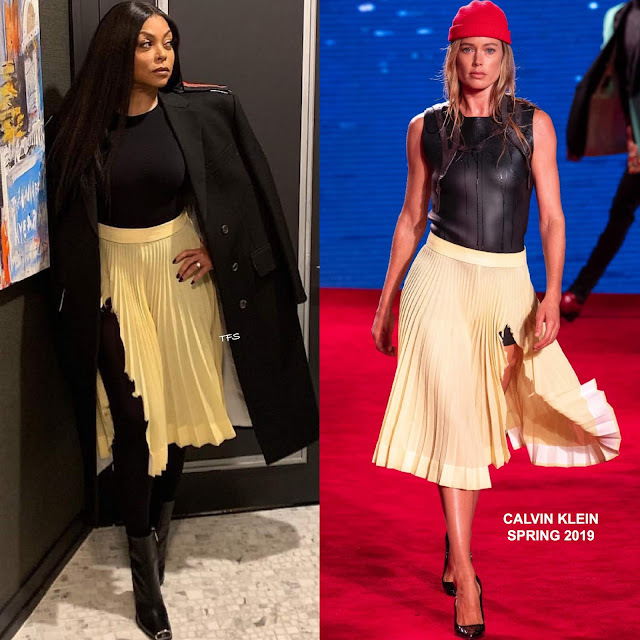 On Saturday(February 2nd) Taraji P. Henson hosted the InStyle Badass Women dinner and her stylist Jason Bolden posted her look to his instagram page. She posed for the gram wearing a black WOLFORD bodysuit, and a ivory pleated CALVIN KLEIN SPRING 2019 skirt, with a black wool coat over her shoulders.Since it was cold, I get the black opaque tights but I think this would have looked so much better with black leather thigh-high boots. Also the torn split comes off as a very silly detail. Wo knows if it was on purpose or not since debut on the runway the same way but it is still a silly look. Are you feeling Taraji's instagram style?